Gamebookers are offering 50% bonus op up to €50, which will mean a €25 in bonuses. This promotion is possible with both new and existing accounts. Please note the the amount must be wagered at a minimum of 20x before selling any chips. Gamebookers is now part of the PartyGaming network and has been since 2006 when the company was bought over. The firm first came into being in 1998 which means they have a decade of experience in the industry. 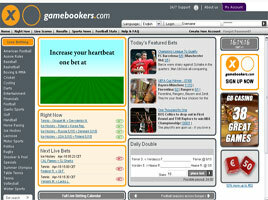 Gamebookers greet visitors with a fairly busy home page and with a few moving images, graphics and ticker tape going on; it can be a lot to take in. There is a deviation from most sites in that there isn’t really a selection bar running across the top of the window but this may be down to the fact that the site mainly focuses on the Sportsbook. There is a 24/7 email support system and a phone facility (only available in English) to offer further assistance to members having problems. There appears to be more of a slant given to American sports than on most other sites. Certainly the home page made more news about baseball and American Football than most sites would and there is a wide selection of sports available in this book. The football bets contain the majority of options to choose from including 1st to score, handicaps and so on. There are also financial markets and chancing on the first UK lottery ball section hidden away amongst the sports. On first impression, it is easy to believe that there is only really the Sportsbook to choose on with the Gamebookers website. There is no real notification of anything else until you click through the Casino icon on the right hand side of the screen. The user is then taken to a new window where table games, slot games, video games and other games including Bingo and Keno. It would be extremely easy for casual users to come to the site and think there was no selection of games. There is a 100% offer for new members to the site up to £25. This is pretty much a standard introductory offer and on par with what most other sites offer. Given there is a paucity of main options provided by Gamebookers, there is not much chance of any exceptional extra being made available by the site and this turns out to be the case. There is a selection of football statistics for the major leagues in Europe as well as a collection of sporting news articles. Nothing to get greatly excited about and there appears to be a number of better sites offering more than Gamebook provides its users.